Wake up, make some coffee, drop the kids off at soccer practice, run a few errands, eat, pick up the kids, go home, eat, sleep. Does this sound familiar? 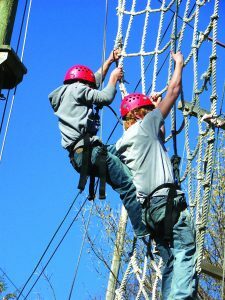 See how well you can do on the Challenge Course at PWELC. So often, we get caught up in our daily routine. We look at our Google Calendar, our planner, or our daily to-do list and compartmentalize our day, allowing little room for adventure or excitement. And our kids get pulled into the routine as well. They have soccer practice, piano lessons, swimming lessons, and little time to explore nature and spend some quality time outdoors. Prairie Woods Environmental Learning Center (PWELC) can help you change that. PWELC is a regional center used to educate people about the environment and outdoor recreation. Every summer Prairie Woods hosts different events to draw the public out to their spacious expanse of prairie. 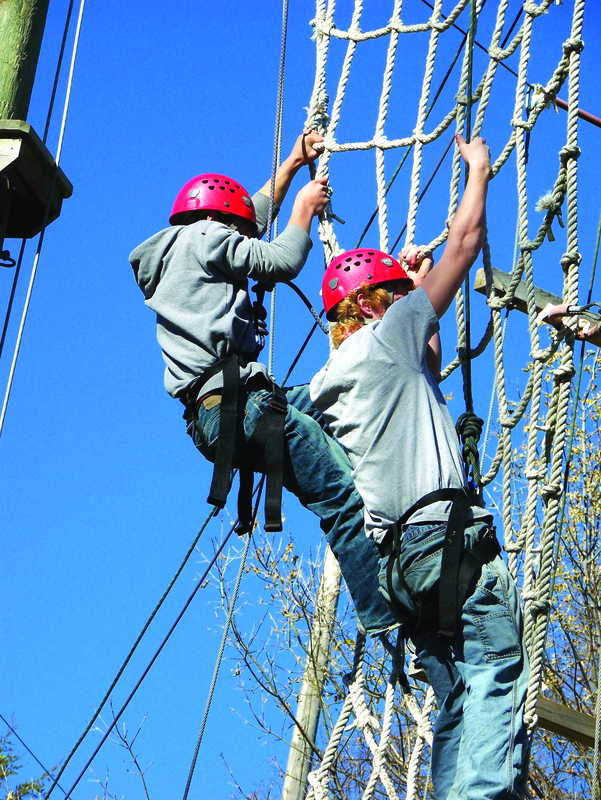 Indoor and outdoor rock climbing, the flying squirrel, animal tracking, outdoor survival—PWELC has just about any outdoor activity you can think of, and then a few more. In the remaining days of June you can partake in PWELC’s Kayak the Crow River event. Anyone over the age of 12 can take a boat out on the water solo, but Prairie Woods does offer other options for younger children if you call in advance! Join PWELC guides for a water adventure with the kayaks, gear, and instruction provided. Register soon, because there’s a maximum of 18 participants due to boat availability! 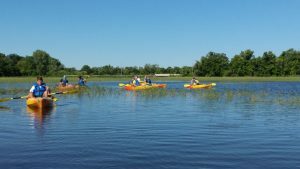 After signing up, you’ll meet at the Mill Pond Beach on Friday, June 29th from 1:30 to 5:30 and spend the afternoon kayaking down the river for only $15. Sounds like a great deal to me! 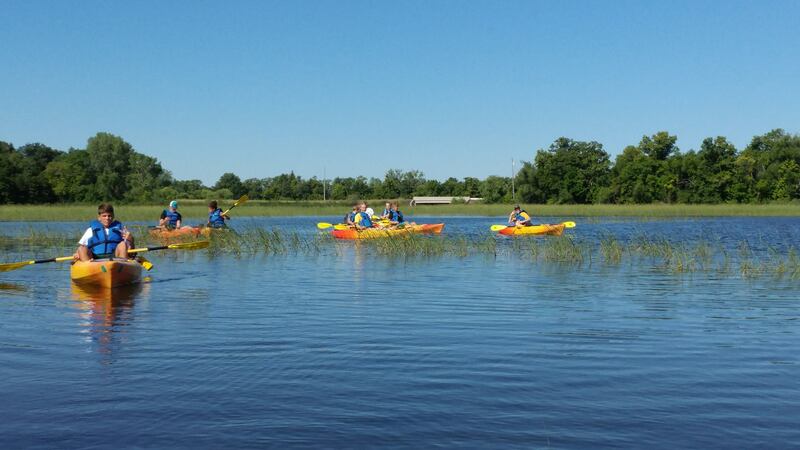 The Yellow Boats Project is a great way to get your group accustomed to kayaking. In July, the PWELC Yellow Boats Project will be participating in the New London Water Days Event in 2018. This means that PWELC will be bringing all their yellow kayaks over to the Mill Pond for community members to use for free! From noon to 3 p.m., Prairie Woods team members will be strapping on life jackets and pushing willing paddlers out on the pond. Make sure you’re there to be a part of it! If your kids are more interested in exploring nature by foot, drive out to Prairie Woods during their Nature Days event for kindergarten through third graders. For three mornings (August 14-16), PWELC staff members will be leading a three-hour excursion into the natural world, using hands-on activities and games. Explore the forest, prairie, and wetlands all on PWELC grounds, taking in the beauty and tenacity of nature. This event is $55 and also requires a bag lunch and a water bottle. One routine that might be more exciting than your classic work-eat-sleep schedule is that of a pioneer. Out at PWELC, 3rd through 6th graders can learn what it takes to live as a pioneer in Minnesota. They start by dressing as a pioneer. Then they move on to learning indoor chores, which include making a pioneer lunch. After lunch, they’ll head outside for outdoor chores, including doing laundry, cutting wood, and beating rugs. You can watch as your child has fun learning this new, or very old, routine that teaches them a little about Minnesotan history. 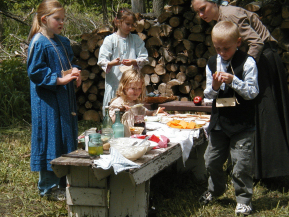 Pioneer Days is a great way to teach your children to appreciate the hard working life of a pioneer. And there’s always the Full Moon Canoe adventure for friends and family to experience the water as day turns to dusk. 5th graders and up (that includes you, moms and dads) can take a couple of hours to experience the solitude of the Prairie Woods wetland while watching the sun set and the moon rise. Children need to be accompanied by an adult, so it’s a perfect excuse for a family outing before bed. The event is on Friday, August 24th and goes from 6 to 8 p.m. and is $7 a person. With all these opportunities to get away from the monotonous routine we sink into, from ballet lessons to basketball camps, how could you not take advantage of these events located right in the Willmar Lakes Area? Delete a few events from your Google calendar, find a free day with the kids, and drive on out to the Prairie Woods Environmental Learning Center. Soccer practice can wait. It’s time to bond with your kids in the great outdoors.